On Monday, June 26, 2017, the Supreme Court announced that it will hear the Travel Ban cases when it reconvenes later this year, in October. The first Travel Ban (Executive Order 1) was announced on January 27, 2017, and was replaced by a second Travel Ban, issued by President Trump on March 6, 2017 (“Executive Order 2, or EO 2”); for more background on the ban, please see our blog here. 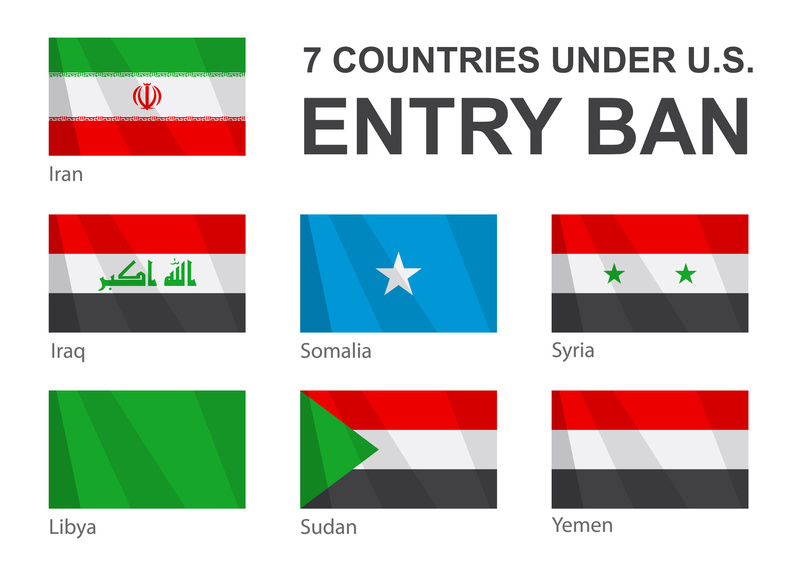 Until yesterday, President Trump’s EO 2 affecting 6 Muslim-majority countries had not been implemented anywhere in the U.S., as the ban was subject to injunctions by several district courts and circuit courts of appeals. Yesterday, however, the Supreme Court announced that it would allow the Trump administration to implement only parts of President Trump’s second executive order, which bans the entry of nationals of Iran, Libya, Somalia, Sudan, Syria, and Yemen from the United States and suspends the admission of all refugees for 120 days. The Court ruled that the government can only enforce the travel ban against foreign nationals who do not have “a credible claim of a bona fide relationship with a person or entity in the United States.” Thus, it is important to note that the Court’s decision will not allow President Trump to ban as many individuals as his EO 2 sought to do; the Court placed limits on who President Trump and his immigration-related agencies can prevent from entering the U.S. It is unclear from the ruling who will be allowed to enter the U.S., that is, who will be found to have a “credible claim” of a relationship with a U.S. business or person. It is likely that some people will be turned away from the U.S., even when they think they have presented such a credible claim. Individuals from the six countries who are dual nationals and traveling on a passport of a country not covered by the order should be allowed to enter the U.S. Individuals who have valid immigrant or non-immigrant visas issued on or before June 26, 2017. Individuals with visas coming to live or visit with family members. Individuals who “wish  to enter the United States to live with or visit a family member” must have “close familial relationships” in order to establish a credible claim that the Supreme Court described. The Court specifically mentioned a spouse and a mother-in-law as examples of qualifying relationships; what is uncertain is whether more distant relatives will be considered a qualifying relationship. Students who have been admitted to a U.S. university, workers who have accepted offers of employment with U.S. companies, and lecturers invited to address an American audience. The Court listed these three examples of individuals who have credible claims of a bona fide relationship to an American entity. The relationship must be formal, documented, and formed in the ordinary course of business (i.e. not just for the purpose of evading EO-2). Although the Trump Travel Ban has a cap of 50,000 refugee admissions per fiscal year, the Supreme Court has said that the 50,000 number can be exceeded if refugees have the requisite credible claim. Many refugees processed overseas have family or other connections to the United States, including with refugee resettlement agencies. Those refugees cannot be excluded even if the cap has been reached or exceeded. Note, if you believe you are exempt from the ban, you should be prepared to show evidence of your “bona fide relationship” when you apply for admission to the U.S. from the U.S. Customs and Border Protection or when you apply for a visa from the U.S. State Department or US Citizenship and Immigration Services. Whose entry is more uncertain? Other types of business travelers. There are some employment-based visas that do not require a petitioning employer; from the Court decision, it is not clear if such visa holders will be able to demonstrate the requisite relationship with a U.S. entity. Individuals who form bona fide relationships with individuals or entities in the United States after June 26, 2017. Citizens and nationals of the six designated countries who do not have a qualifying relationship in the United States and who are coming for other reasons (including sight-seeing) will likely be barred from entering. If you have a question about how the Travel Ban will affect you, your family, or your business, please schedule a consultation with our attorneys.